Hide deals from seller "Sharkey's Car Wash"
Limit 1 per person and 1 per transaction. Valid toward services. Full value of Gift Certificate must be redeemed in 1 visit. 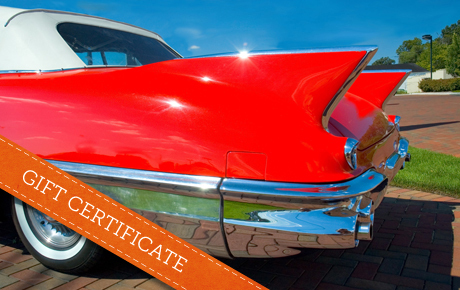 Give your fins a flawless shine with 52% off a $25 Gift Certificate to Sharkey’s Car Wash and Detail Center in Rolling Meadows. This full-service car wash and detail center caters to all vehicles, from classic rides to newer models fresh from the showroom floor. In business for just one year, Sharkey’s provides patrons with old-school service and attention to detail. Their experienced staff will go the extra mile to give your car a like-new shine. They offer everything from basic car washes and detailing to paint restoration, tar and oil removal, and hand wax treatments. Their add-on services like rust inhibitor treatments, undercarriage washes and whitewall cleaning will leave your car fresh and spotless without breaking the bank. Offers full-service detailing, car wash and car maintenance in Rolling Meadows.